The faculty and staff at Union County College are committed to providing you with a coherent and relevant curriculum as well as learning opportunities that will engage and challenge you. We place you, the student, at the center of what we do and will help you to grow intellectually within a culture of respect and discovery. All students must earn a minimum Cumulative Grade Point Average of 2.0 or better in order to obtain a degree or certificate. Any Union County College student maintaining less than a 2.0 cumulative grade point average is considered not in good academic standing as defined by the College, and therefore, may be assessed for probation and dismissal recommendations. Recommendations regarding probation, dismissal, and conditions of re-entrance are made to the Vice President for Academic Affairs. A written notice is sent to students notifying them of their probation or dismissal status. Academic Probation - The College recognizes that transitions are oftentimes difficult for students; and therefore, administers a probationary period. Students who fail to maintain a 2.0 cumulative GPA or better will be placed on probation for one semester. Students are expected to achieve a 2.0 cumulative GPA in their subsequent semester in order to retain their enrollment in the college. Academic Dismissal - All students failing to reach their minimum cumulative GPA, as defined by the College are placed on probation. After their probation period, students on probation will be assessed for dismissal from the college. All dismissed students must wait at least one full semester (excluding Summer Sessions) before they can seek readmission into the College. Students may be readmitted to the college only twice after sitting out in accordance with the dismissal action. Appeals - In special circumstances, dismissed students may seek a waiver of their dismissal by submitting a written appeal to the Academic Progress Committee for consideration. The Vice President for Academic Affairs has the authority to make all final admission decisions. Credit Loads - Any student placed on probation may not carry more than 13 credits per semester without approval of the Vice President for Academic Affairs or her/his designee. Extracurricular Activities - While on probation, students are restricted from holding any office in any organization or participating in any extracurricular activity of the College. Students who have been absent from the College for two (2) full years, have been readmitted and earned at least twelve (12) credit hours with a 2.0 average or higher on the hours earned after readmission, and who wish to have former grades and credits omitted from the calculation of the grade point average may apply for academic forgiveness to the Vice President for Academic Affairs. The granting of academic forgiveness is not automatic. Each case is judged on its individual merits. Academic forgiveness may be granted only once and is irrevocable. Students interested in academic forgiveness must see an advisor about the ramifications of making such a request. Courses may not be excluded if required for current major. A faculty member is entitled to freedom in the classroom in discussing his or her subject, but should be careful not to introduce into his or her teaching controversial matter which has no relation to his or her subject. Academic dishonesty is defined as, but not limited to plagiarizing or cheating by any means during a test or examination, or in any work intended to be done independently (such as term papers, reports, essays, take-home examinations or online assignments, pictures, photography, plastic sculpture, etc.) and submitted as work to be graded or otherwise evaluated by a faculty member. Permitting another to copy for a test or paper also constitutes academic dishonesty. An in-depth explanation of proper citation can be found in the MLA Style Manual, the Chicago Manual of Style, and Kate Turabian’s A Manual for Writers of Term Papers, Theses, and Dissertations. Additional citation guides can be found at each of the Union County College libraries. Librarians will assist students in locating appropriate citation resources, enabling students to refer to information in an ethical manner as outlined in the Information Literacy Competency Standards for Higher Education from the Association of College & Research Libraries (ACRL). There is an expectation that students will present as their own work only that which they have done themselves. The College will not tolerate dishonesty at any time, whether it be plagiarizing (the act of representing someone else’s ideas as your own) or cheating by any means during a test, an examination, or in any work intended to be done independently. Copying from another person’s test, electronic device, or paper. Permitting another to copy from a test or paper. Using crib notes or any instrument not authorized by the instructor. Concealing notes on parts of the body, desk, or other object. Using cell phones or texting during examinations. Claiming authorship of work that is not your own. Buying or selling quizzes, exams or term papers for the purpose of academic evaluation. a. Take an examination in your place. b. Complete take-home examinations or other assignments. c. Complete work for the purpose of academic evaluation in online courses. Representing someone else’s ideas as your own without crediting your source. Submitting assignments that do not include proper acknowledgment of the original source. Quoted material must be put in quotation marks and credited to the original source. Paraphrasing another’s work without proper attribution. Submitting deliberately misleading attributions or acknowledgments. Submitting a purchased term paper, or another person’s work as one’s own. Failing to properly document information obtained on the World Wide Web or other Internet sources. The academic records of students are kept in the Registrar’s Office under the jurisdiction of the Registrar and apart from any disciplinary records, the latter being retained in the office of the Student Conduct Officer. Transcripts of academic records contain only information about the student’s academic status. The Family Educational Rights and Privacy Act of 1974 (FERPA) sets forth requirements designed to protect the privacy of students. The act speaks directly to statutes governing (1) access to student records and (2) the release of such records. Union County College complies with the intent of this legislation. Students are therefore assured of access to those educational records described under the law and their individual rights of privacy are equally protected by limitation of transferability of such records without their consent. Union County College awards transfer credit to students who have taken Advanced Placement courses and have achieved a score of 3 or higher on the Advanced Placement Examination for a particular subject. Transfer credits earned by way of Advanced Placement count toward the maximum number allowed toward a certificate or degree program. Students are required to attend the classes, laboratories, and clinical sessions for which they are registered. Students are graded according to course learning outcomes and requirements established and distributed by the instructor. While attendance alone cannot be used as a criterion for academic evaluation in any course, the instructor has the prerogative to give or decline opportunities for making up work missed due to absences. Excessive absence may affect a student’s grade. Excessive absence is defined as, with the exception of medically excused absence and religious holidays, more than three cuts in a class that meets three times a week or more, or two absences in a class that meets twice per week. The instructor should be notified of extra-curricular absences prior to missing class. The application of this policy is left to the individual instructor who, at the beginning of each semester, will provide the specific requirements of his/her course in the course syllabus. The instructor may use the quality of class participation in determining student grades if it has been specified as a requirement of the course. In the event of an extended absence (3 or more days), the Dean’s office should be contacted. Students may audit courses. Students must meet all admissions and course pre-requisites to register for the course, pay the regular course tuition and fees, and may participate in all course activities, except that they are not permitted to take examinations in the course, unless approved by instructor. In no case will the student receive a grade for an audited course. Auditors must secure written permission from the instructor within the first five days of the start of the course. No student may change from audit to credit without written approval from the Vice President for Academic Affairs. Audit is a non-credit grade which will not affect the student’s grade point average and an “AU” grade is printed on the student’s academic record upon completion of the course. The AU grade is a non-punitive grade. In some courses, challenge examinations may serve as the basis for students to earn credits. Students who pass the examination with the minimum required grade will be awarded credit for the course challenged. The course credit will be recorded on the student’s Union County College transcript. Should the student fail the examination, a copy of the challenge exam indicating failure will be filed; no credit will be granted on the Union County College transcript. No student who has taken and failed a course shall be permitted to retake the course via the challenge examination. A student who wishes to obtain advanced standing through a challenge examination must obtain a challenge exam from the appropriate Division. If the student is deemed eligible, he/she completes the Request for Challenge Examination form and makes payment for the exam. The completed form and payment receipt are then brought to the Division Dean so that the time and date of the examination can be determined. The required fees for challenge examinations will be based upon 50 percent of the current course tuition. Students will be furnished general exam requirements. Challenge exams are not offered for all courses. CLEP (College Level Examination Program) provides a method of earning college credits by passing a CLEP examination in various subject areas. Students may apply for CLEP through www.collegeboard.com. Union County College awards a maximum of 12 credits for the Language CLEP exam, and up to 9 credits in other subject areas. The list of approved subject examinations for CLEP may be viewed at https://www.ucc.edu/testing. Transfer credits earned by way of successfully passing CLEP examinations count toward the maximum number of transfer credits allowed toward a certificate or degree program. Union County College does not grant credit for a CLEP exam if a student has attempted a college-level course aligned with that exam. For example, if you successfully completed English 101 or a comparable course, you may not receive CLEP credit in that same subject. Also, the College does not permit students to earn CLEP credit for a course that he/she failed. Union County College administers CLEP tests to its students, in the Testing Center on the Cranford campus. If you are a Union County College student, please go to www.CLEP.com to select and pay for the test of your choice. Do not select a test site. After you pay College Board for the CLEP test, print out your ticket. You will need to bring this ticket and a government issued ID with you when you take the test. Call the Testing Center at 908-709-7486 to schedule the date and time of your CLEP test or email testingcenter@ucc.edu for a current schedule. In awarding credit hours, Union County College conforms to state and federal definitions, as well as any policies set forth by the Middle States Commission on Higher Education. Union County College has fall and spring semesters that consist of 15 weeks of instruction that include a final exam week. The College also offers 6- and 10-week summer terms, an 11-class winter session, 13-week Saturday or Sunday sessions, and 11- or 12-week Later Start classes, which begin in the third week of each fall and spring semester. All scheduling options include an additional final exam week and comply with all policies regarding meeting times and amount of work required. Courses with multiple students that meet and participate in various forms of group instruction under the direct supervision of and instruction by a faculty member, wherein the student performs substantive work in a classroom setting. Courses with a focus on experiential learning under the direct supervision of and instruction by a faculty member, wherein the student performs substantive work in a laboratory setting. The credit to contact hour ratio is 1:2 or 1:3 as stipulated by the New Jersey President’s Council. When a student repeats a course, only the higher grade will be averaged in the cumulative average. A student may not repeat a course more than once, including a “W” grade, to improve the grade received initially without written approval from the Division Dean. Repeating a course when a “D” or better grade was previously recorded will not earn additional credits for the course. Only the grade-point average may be improved. Both courses will remain on the transcript. Students may request a course waiver or substitution if the required course needed for graduation is not available. Course waivers are given at the discretion of the Division Dean. It is strongly recommended that students obtain course waivers before registering for the substitute course. Courses waived do not appear on the student’s transcript. If the waiver involves more than one Division, the waiver form requires the signature of both Deans. After both appeals, the request is sent to the Vice President for Academic Affairs for final approval. All waivers are kept on file in the Registrar’s Office until the student graduates. A two-and-one-half-hour final examination is given at the conclusion of all courses. Students are required to take all tests or examinations on the days scheduled when such tests or examinations are announced in advance by the instructor. Make-up tests or examinations shall be given at the discretion of the instructor. Unannounced quizzes may be given at the instructor’s discretion. Students requesting grade changes must present their appeal to the classroom instructor who awarded the grade. It is the instructor’s prerogative to determine whether there is justification for a grade change. If a change is approved, the instructor must secure the required grade change form from the division secretary or Registrar’s Office. The grade change form must be forwarded to the Vice President for Academic Affairs for approval in order for the grade change to be officially recorded on the student’s record. * An “Incomplete” grade may be given in cases of extenuating circumstances approved by the Instructor. A grade reported as “Incomplete” at the end of a semester will be permanently recorded as ” XF”(=F) if the Incomplete is not removed within the first six weeks of the next regular semester. It is the student’s responsibility to make acceptable arrangements with the instructor to complete the course requirements within this period. If the student is unable to contact the instructor, timely notice should then be given to the Division Dean. It is the student’s responsibility to report an error on his/her recorded grade to the Instructor within two weeks of posting of the grade. Otherwise, it is assumed that the grade recorded is accurate and will be recorded permanently on the student’s record. A student’s academic standing is based upon his/her performance in all courses expressed in terms of the “academic average” he/she achieves. In computing this average, the following numerical values are assigned to each letter grade. Numerical quality points are then determined by multiplying the above values by the number of credit hours which the course carries. For example, a three-credit hour course in which the student receives a B represents 9 quality points earned. 41.5 divided by 19 results in a 2.18 grade point average. Grades received in the preparatory or developmental courses are not included in the computation of averages, but are considered in the calculation for assigning probation or dismissal by the Academic Progress Committee. Instructors enter final grades online. Students must go to webservices.ucc.edu to view or print their final course grades. Instructors are not permitted to post grades by social security numbers. No information regarding grades will be offered over the phone. 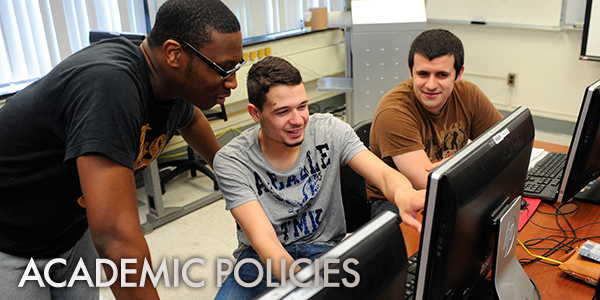 It is College policy that every instructor must provide students with a written statement regarding his/her grading policy at the beginning of each academic term. Students who have not received such information prior to the end of the second week of classes should ask the instructor for a statement outlining the grading policy to be followed. It is the responsibility of students to meet with an advisor to make sure they have taken all courses required in their program, and that they have sufficient credits each semester to meet the requirements for graduation. Students are strongly encouraged to meet with an advisor to review their program requirements prior to completing a graduation application. The student must submit the application for graduation. Students enrolled in Cooperative Programs with JFK Medical Center Muhlenberg Snyder Schools, Trinitas School of Nursing, or Rutgers SHRP must consult with the program advisor. All degree or certificate recipients are eligible to participate in commencement exercises for the academic year. There are two commencement ceremonies each year; one is held in January, and one is held in May. Students leaving the College before they complete their program who intend to transfer back credits from another institution must ensure that they have secured written approval from Admissions to transfer courses back to Union County College. The transfer credits must be approved by the Dean. Until the Registrar’s Office has cleared the student for graduation, no degree or certificate information will be entered on the student’s transcript or issued. Degrees or certificates issued will carry the graduation date closest to the date of final clearance. Automatic Degree Awarding - Union County College has instituted a process which makes it easier for students to gain the certificates or degrees they have earned. Students are automatically awarded the degree or certificate for their declared program of study as it is completed, no application is necessary and there is no fee for graduation. Students will be notified of their candidacy for graduation at the beginning of the semester via their Union County College student email. Degrees and certificates are officially issued following the conclusion of the spring (May), summer (August), and fall (January) terms. After grades are due for the term, a final review will be conducted to determine if a student has successfully met all graduation requirements. At that time, the degree or certificate will automatically be posted on the student’s transcript, and students will be notified via their Union County College student email. Prior to conferral of their degree, students will have an opportunity to defer their graduation. Commencement - Commencement is the ceremony for students, family, friends, and the College community to celebrate the student’s academic accomplishments. Participation in the ceremony means that students are eligible to graduate in that term; however, it does not mean that the student has earned a certificate or degree. There are four commencement ceremonies each year, two in January and two in May. Students that are eligible to graduate in summer (August) or fall (January) terms may participate in the January ceremony. Students eligible to graduate at the conclusion of the spring (May) term may participate in the May ceremony. Participation in a ceremony outside of a student’s eligible term may be granted provided that the student has less than 8 credits remaining to be completed and is registered for the course(s) in the following term. The commencement program will include the names of students eligible to graduate by term. Students are required to confirm attendance at the ceremony by responding to an email from the Registrar informing them of their candidacy to graduate. There is no fee to participate in graduation and cap and gown are provided to graduating students free of charge. Students seeking second degrees at Union County College must meet with an advisor to review program requirements prior to pursuing a second degree. Students who have earned a certificate credential at Union County College can use half of the certificate program credits that are applicable toward a second certificate program. Students who have earned a certificate credential at Union County College can use all of the certificate program credits that are applicable toward a degree. Student seeking a second degree at Union County College can use half of their degree program credits toward a second degree program at Union County College. Requests for Union County College transcripts can be made by visiting the College website at www.ucc.edu, or by visiting the National Student Clearinghouse at www.ucc.edu/. Current students and students with active College email accounts can log in directly to Owl’s Nest site or Web Services and request a transcript. A fee is charged for each transcript. Students with any outstanding financial obligations will not receive a transcript until all financial obligations have been met. Union County College welcomes applicants transferring in from other institutions. Courses transferred must be from accredited colleges and/or universities. Students transferring to Union County College must complete a minimum of 24 credits of their degree program at Union County College, all other credits can be transferred in but must be applicable to the student’s current program of study. Non-remedial courses with a grade of “C” or better will be considered for transfer credit. All modes of instruction, including face-to-face, online, and hybrid courses, will be considered for transfer credit. Students interested in transferring courses to Union County College must complete the College application process, and have official transcripts mailed to Union County College’s Admissions Office. Official review and granting of transfer credit will be completed by an advisor in collaboration with the appropriate Academic Dean. Awarding transfer credits will be based on program requirements, transfer regulations, and the New Jersey State Transfer guidelines at http://www.njtransfer.org/. Transfer credits awarded will be posted and can be viewed on Web Services under “Program Evaluation.” Grades are not transferred from other institutions. Transferred courses will be listed as “TR” for transfer credit on the student’s transcript. The office of the Vice President for Academic Affairs has the responsibility for final determination of the acceptance or denial of transfer credit. If the student changes his/her program at any time, he/she must request to have his/her transcript re-evaluated, the transfer credits previously awarded may not apply to the student’s new program choice. Science courses that were completed five or more years prior to being admitted to any health science program may not be eligible for transfer. Graduates of the John H. Stamler Police Academy and/or the Union County Fire Academy will be granted advanced standing credit toward an associate degree after admission and matriculation into the Criminal Justice or Fire Science program at Union County College. Each program has designated credits which will be granted - Police Academy up to 17 credits, Fire Academy up to 18 credits. It is the student’s responsibility to supply the College with proof of graduation from the academy and official transcripts of all previous college work at the institutions attended. Withdrawal from all courses in which a student is enrolled in a given semester/session constitutes a withdrawal from College. Withdrawal from College during the official withdrawal date set in the College’s Academic Calendar for semester/session requires that the student submit an official request for withdrawal through a drop/add withdrawal form. Students should consult with an advisor before withdrawing. Unless this request has been completed by the student and submitted by the appropriate withdrawal dates, the withdrawal is considered “unapproved” and will result in a final grade of “F” or “UF” in all classes. Financial aid recipients should discuss the implications of withdrawing from class with the Financial Aid Office in order to gain an understanding of any implications withdrawing has on their financial aid status. Refund and withdrawal eligibility will be based upon the date on the drop/add or withdrawal froms. A student who withdraws from all classes within the published withdrawal dates, providing there is no violation of academic integrity, will have that withdrawal recorded as a “W” as long as all appropriate forms have been filed. The official withdrawal period is published in the College’s Academic Calendar. Students may withdraw from a course(s) at any time during the official withdrawal dates posted for the semester/session. Students who wish to drop a course(s) must fill out a Drop/Add Courses Form and submit it to the Registrar’s office. Please note that some courses do not run for the traditional 15 week semester and an equivalent withdrawal date is calculated and published each term. Official withdrawal can only be accomplished within the dates listed for that semester/session. These dates are identified in the College’s Academic Calendar, which is available at www.ucc.edu. Students who withdraw will have a withdrawal “W” grade recorded on their transcript. The “W” grade does not impact the student’s Grade Point Average (GPA) but it does count as having taken the course. Students may not repeat a course more than once without written approval from the Division Dean. Students should talk to their instructor and an advisor before they consider withdrawing. Withdrawal may change eligibility for federal financial aid and a student’s status from full-time to part-time. Students participating in the Educational Opportunity Fund (EOF) must contact the EOF Office prior to submitting a request for withdrawal form. Also, students receiving Financial Aid funding must contact the Financial Aid Office prior to withdrawing from one or more courses. An Incomplete “I” grade cannot be changed to a “W” grade.